I’ve been debating whether or not to write about this here. This is a breast cancer blog, after all. But after the two shootings of black men by police officers this week and then the murder of 5 police officers in Dallas, I realize that I can’t remain silent. For those of you who don’t live in America and might not know what I’m talking about, there were two shootings of black men by police officers this week. This is not something that is new in our country, unfortunately. The systematic abuse of power by the police and our justice system has spurred a movement called #BlackLivesMatter, to try to bring about change in the way we treat our community of color. What made these two shootings unique is that they were both caught on camera. Well, the shooting of Alton Sterling was caught on camera. The video of the shooting of Philando Castile begins just after his shooting, but we watch him die. His girlfriend recorded the whole thing. Her 4 year old daughter was in the car and witnessed the shooting. It’s terrible. In the last three days, I have seen an uproar in this country unlike I have seen in a long time. We’ve been angry before, like with the murders of Trayvon Martin, Eric Garner and Sandra Bland, to name just a few. But nothing like this. Our country is in pain. Cancer in the body is a big bully, a cell that deviates from normal, healthy cells that do their job and work in harmony, and gang up on those cells and wreak havoc, disrupting and destroying that harmony. The incidents this week have got me thinking about the problems we have in this country. It made me think of our country’s cancer: racism. I think, as a whole, there are a lot of amazing and wonderful people in this country. People who want to live the American dream but in harmony with others and by benefiting others. Then you have those that are the cancers of our society. The ones who are power hungry, fearful and bigoted. They have been overpowering our country and it’s time we’ve ended them and their ideologies, like we do cancer. By this, I mean we need to restore the peace and love that we are all born with. Just like most of us are born into healthy working bodies, most of us are born into healthy minds and hearts. Somewhere along the line, we learn to hate and fear people who are different from us. We learn to create an “us” versus “them” mentality. That is our country’s cancer. In America, it is not safe to be black. It is definitely not safe to be a black man. This is not new. But now we have very clear video to prove it. “But Carrie, this is a breast cancer blog. Shouldn’t you be talking about breast cancer and not the murder of black men in America,” you ask? To that I say, sure. Let’s talk about breast cancer and race. According to breastcancer.org, white women are slightly more likely to develop breast cancer. However, black women are more likely to die from it. In fact, according to an article published in Time Magazine last year called What Race Has To Do With Breast Cancer, “Among the 102,064 women across a broad range of social, economic and cultural strata from 18 different cancer centers who were diagnosed with breast cancer, African-American, Hispanic, Asian and American Indian women showed 20% to 60% higher rates of diagnosis with stage 2 to stage 4 breast cancers of any type compared to Caucasian women. The risk was highest among African-American women, who had a 40% to 70% greater risk of being diagnosed with stage 4, the most advanced, of any type of breast cancer, compared to white women.” And while genetics play a factor in this statistic, so do social factors such as income and access to healthcare. Many have less access to breast cancer screening and are not offered the same level of care. The article states that while these women might get a mastectomy to remove the tumor, they might not be getting the follow-up treatment such as radiation, like their Caucasian counterparts are getting. There is a racial divide in our community and our breast cancer community. More black men and women are dying at the hands of police officers. More black women are dying at the hands of their breast cancer. It’s all connected. What do we do about all of this? That seems to be the big question going around. “What do we do?” Many of us are feeling helpless and desperate. As a white woman, I come from a place of privilege that I get to sit here and feel that. I know that. I’m not sure what to do. I don’t know what I’m going to do. I hope that writing about what happened this week for my breast cancer community to read is something. I hope that it sparks thought and conversation. I hope that it helps us question our society and advocate for the type of America we all want to be living in. I hope it means we don’t remain silent. We are often called “warriors” for fighting our cancer. Whether we like it or not, that is how we are seen. Maybe we see that in ourselves. Maybe not. 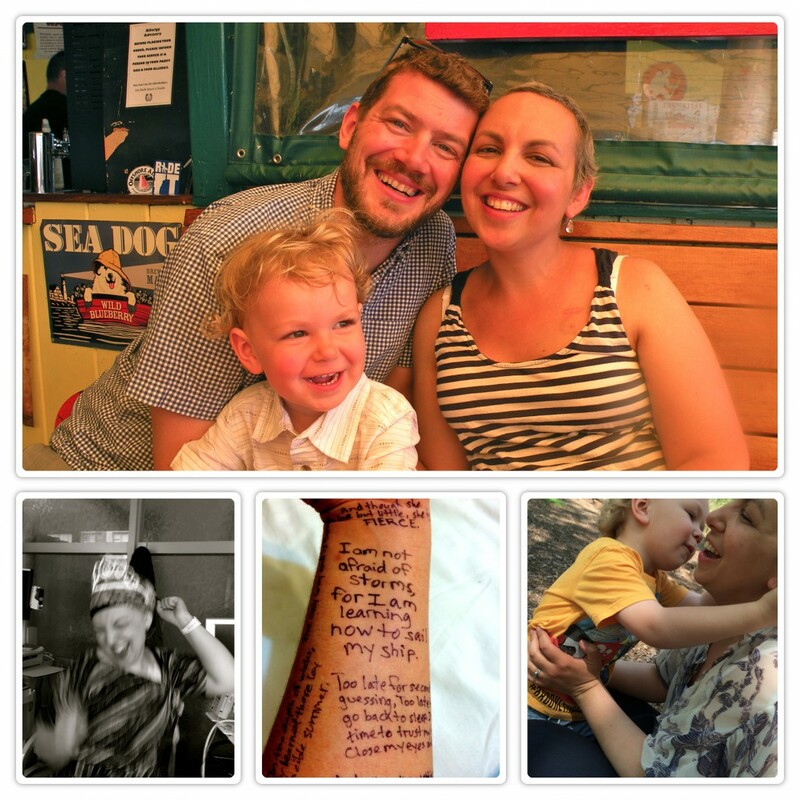 But, you’ve got to admit, a breast cancer survivor is a force to be reckoned with. We have a fight in us. We have power. What would happen if we took some of that fight, some of that power, to kill America’s cancer too? Categories: Uncategorized | Tags: abuse of power, access to healthcare, Alton Sterling, America, America's cancer, Black Lives Matter, breast cancer, income, Philando Castile, police brutality, police shooting, privelage, race, race and breast cancer, racism, social status | Permalink. Oliver did not care for the rainbow (actually, he just didn’t want his picture taken). Categories: Bits of Happiness, Uncategorized | Tags: bits of happiness, breast cancer, brooklyn, rainbows | Permalink. When you make ice cream for dinner!!!! We each had three bowls! YUM! Categories: Bits of Happiness, Uncategorized | Tags: bits of happiness, breast cancer, ice cream, ice cream for dinner | Permalink.